Fresno, CA - Sixty years ago in the city of Fresno, which is in the heart of California’s San Joaquin Valley, and is also also known as the “agricultural capital of the world” the Serbian Community organized a parish dedicated to the Holy Apostle Peter and celebrated their first Slava, Petrovdan. 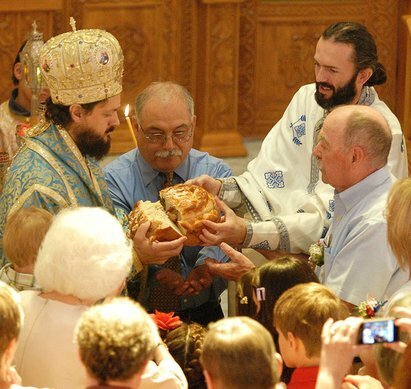 Today much has changed since those early years with the parish once again gathering on Sunday, July 17 for their Petrovdan Slava Observance. The Hierarchical Liturgy was concelebrated by His Grace Bishop MAXIM, paish priest Protojerej Stavrophor George Gligich, the Diocesan Chancellor Hieromonk Jovan Babic and Protodeacon Brad Matthews, parish deacon. The responses were sung by the congregation led by the parish choir. In his sermon His Grace Bishop Maxim offered his comments on the Gospel reading. He said that the Lord came to the world to free man from the tyranny of evil—especially, the demonic evil. Although there are many forms of evil, there exists no bigger and more serious form of evil from that which is outside of man’s control. The Gospel narrates that two men were possessed by evil and the evil held them captive, keeping them in cemeteries. It is very indicative that they stayed in cemeteries. The obvious reason for this is: because the demonic evil is connected with death. But, our Merciful Lord, who doesn't fear any evil force, opens a dialogue with these two men. They ask him immediately: "What have you to do with us”? Their question reveals a very basic truth: there is not and never will be any reconciliation between demons and God. But, by saying it they want to tell him: “Leave us alone! You mind your work and we shall mind our work!”, so the demons want to confirm the division in the existence, the gap, and two separate areas! Unfortunately, we often follow this deceitful way. Many times we organize our life, social and political, and we say even to the Church: “Do not interfere with the concerns of the world. The world belongs to Satan.” On the contrary, Christians are responsible for the world. "What have we to do with you”? - this is a method that evil has invented so that it survives and enables it to have some influence over the world and to exclude us from any responsibility.Furthermore, they add the phrase “Son of God!” What does this reveal? It reveals that faith is not enough to recognize that there is God. The Bible says that “even the demons believe and tremble”! So, there must be something else that is needed. It is trust in God that He can make the impossible possible. Demons teach us what the faith is not about. The dialogue continues: Have you come here to torment us before the time? The demons know that their end is torture, eternal hell. They wish the postponement, as much as possible. On the contrary, we as Christians say: “Thy Kingdom come!” Quickly! Maran Atha! But anyone who is dominated by evil prays for the Kingdom not to come quickly! Here lies the mystery of the freedom in history. Our freedom refers always to the Lord, Who is the winner, in His Second Coming. The dialogue continues into something moving. “If you cast us out,send us away into the herd of swine.” This implies that evil does not influence only man! Evil is transferred from man to the creation. The Ecological crisis testifies to this – the transfer of evil from man to the innocent creation! We have responsibility for the whole creation! There are many stages and steps of evil, ranging from the extreme to the more subtle and deceptive forms. His Grace concluded the sermon inviting the faithful to an ascetic struggle that we are taught by the Martyrs and the Desert Fathers of the Church. The Church is the place for healing and therapy by crying out: Thy Kingdom come! Amen! At the end of the Liturgy the Litia Procession was held with the blessing of the Kolach immediately following. This yeas honored Kumovi were longtime dedicated parishioners John and Heidi Foley. John had relocated to the Fresno area in 1959 from Steubenville, Ohio, and immediately became active in the parish with his family. The luncheon followed in the parish hall with a wonderful meal prepared by Ernie and Cheryl Duran and their committee. Recognized during the luncheon were Vlado and Barbara Cucuk for the donation of beautiful new crosses for the church domes which were blessed and installed the previous day. The original crosses were damaged during a recent spring storm. We also congratulated Branko and Georgia Cucuk on their 60th wedding anniversary that day. Concluding the program was a performance by our parish folklore group who were accompanied on the accordion by John Gligich. The afternoon ended with a prayer of thanksgiving to God for another wonderful Petrovdan.